Addison's disease is a chronic condition that results when the adrenal glands are unable to produce enough of certain important hormones. This can lead to fatigue, low blood pressure, loss of appetite, and darkening of the skin. Many people know that U.S. President John F. Kennedy (1917-1963) suffered from back pain most of his life and that he was assassinated in 1963. But it was not until after his death that the public learned that President Kennedy also had Addison's disease. It is a rare condition that results when the body fails to produce enough of certain hormones * that help regulate important body functions. Addison's disease develops because the adrenal glands do not produce enough of certain important hormones. The adrenal glands are thin triangular groups of cells about the size of an adult thumb. One adrenal gland is located above each of the two kidneys. Among other things, the glands release hormones known as cortisol and aldosterone. But the adrenal glands in people with Addison's disease are not functioning properly, which leaves the people without enough of the hormones they need to keep the body working normally. Cortisol is needed to help the body respond to stresses such as diseases and infections. It also helps the body use sugars, proteins, carbohydrates, and other substances in food for energy. Aldosterone helps signal the kidneys to regulate the amount of salt and water retained in the body. This is important because without the proper amount of salt and water, blood pressure can drop. Usually in Addison's disease, the adrenal glands do not work properly because the body's own immune system turns against the body and destroys part of the adrenal glands. The immune system releases antibodies to fight foreign substances in the body, like viruses. In Addison's disease, the antibodies and cells of the immune system destroy the outer part of the adrenal glands and cause them to release inadequate amounts of cortisol and aldosterone. No one is sure why this happens. The disease also can result from conditions that affect the functioning of the pituitary gland. People with tuberculosis may develop Addison's Disease if the infection involves and destroys the adrenal glands. * hormones are chemicals that are released by glands throughout the body to help regulate the body's function. The adrenal glands are located above each of the two kidneys. When people have Addison's disease, the adrenal glands do not produce enough of the hormones cortisol and aldosterone. The nineteenth century British physician Thomas Addison (1793-1860) was the first to relate the symptoms of Addison's Disease to problems with the adrenal glands. At that time, it was more common, because tuberculosis was widespread. Fortunately, Addison's disease is rare today. It strikes only about 1 of every 100,000 persons. What Are Those Puzzling Feelings? The first signs of Addison's disease can be puzzling to patients and their doctors. The lack of hormones in the body begin to leave the person feeling tired and their muscles seem weak. Patients also can feel dizzy, because of their low blood pressure. Appetite drops, and they start to lose weight from not eating as much. Because salt levels are out of balance in the body, people with Addison's might also hunger for salty foods, like potato chips. Sometimes, people get sick to their stomachs and vomit, and they can develop dark areas on the skin, as if they are tanning. They also can seem unreasonably upset at things or become depressed. Addison's usually develops slowly over many years. The symptoms might be noticed, but ignored as simply the result of working too hard or not exercising enough. About 25 percent of people with Addison's disease do not seek medical help until an accident or other illness triggers a sudden worsening of their symptoms. Without medical help, the sudden worsening can be fatal. Doctors have various tests to check for the proper levels of the hormones involved in Addison's disease. They also can use an x-ray or other diagnostic tests to get an image of the adrenal glands to see if they look damaged. 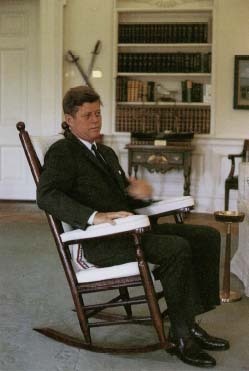 President John E Kennedy in his rocking chair in the White House Oval Office in May 1963. The public did not learn until after his death that President Kennedy had Addison's disease. People with Addison's need to take prescription hormones to do the work of the missing cortisol and aldosterone. Most of the time, this allows people with Addison's to avoid the disease's symptoms. They still might experience a return of severe symptoms, if they get ill with another condition. For this reason, doctors recommend that people with Addison's wear a medical identification bracelet that explains their condition. This is in case they become sick suddenly and are unable to communicate with those trying to help them. With treatment, however, people with Addison's disease can live as long and typical a life as people without the disease do. U.S. National Institute of Diabetes, Digestive, and Kidney Disease (NIDDK), Building 31, Room 9A-04, 9000 Rockville Pike, Bethesda, MD 28992. NIDDK posts a fact sheet about Addison's disease at its website. National Adrenal Diseases Foundation, 505 Northern Boulevard, Suite 200, Great Neck, NY 11021.
i just reciently watched the movie Becoming Jane and learned that Jane Austen died of Addison's Disease when she was 41 hopefully because of the movie people will become more aware of the disease and learn more about it. One of JFK's sisters also had Addison's Disease, she was very thin and frail looking.